Dr. Long is available at other times during the week by appointment. Dr. Long currently serves as the Chair of Graduate Studies within the College of Business. He has served as Associate Professor of Economics at Indiana Tech since the fall of 2013. 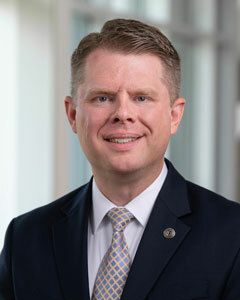 He previously served as the Interim Director of the Ph.D. in Global Leadership program between June-December 2018; faculty lead for the Department of Accounting, Financial Services, and Economics within the College of Business during spring 2018; and the Interim Dean of the College of Business between January-June 2017. Gardinier, M., & Long, J. (2019, February 22). Fostering inclusive classrooms through culturally responsive teaching. Presentation at the Fort Wayne Teaching Conference, Purdue University Fort Wayne, IN. Long, J. (2018, November 2). Using collaborative mini-projects for student engagement in Principles of Microeconomics and of Macroeconomics courses. Presentation at the Professors Conference: Diversity in the Economics Classroom and in the Discipline, Federal Reserve Bank of St. Louis, St. Louis, MO. Long, J. (2017, February 25). The balance sheet of the Federal Reserve, exit strategies, and outlook. Lecture and paper presented at the Economic Outlook Symposium, University of Detroit-Mercy, Clinton Township, MI. Long, J. (2015, November 21). Update on monetary policy actions for 2015. Lecture presented at the Economics Symposium, University of Detroit-Mercy, Clinton Township, MI. Long, J. (2014, October 18). Recent trends in the money supply and economic growth. Lecture presented at the Economics Symposium, University of Detroit-Mercy, Clinton Township, MI. Long, J. (2014, April 12). The aftermath of the bubble. Lecture presented at the Economics Symposium, University of Detroit-Mercy, Clinton Township, MI. Long, J. & Zimmerman, J. (2014, March 2014). Now and the future: The use of free, short online games for principles economics courses. Presentation at Kentucky-Norton Economics Conference, University of Kentucky, Lexington, KY.
Vice President, Ten-Ten International Net, Inc.